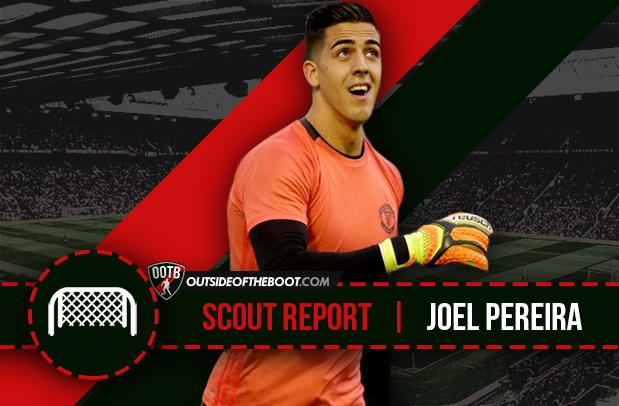 Mateus Carvalho provides a comprehensive scout report on Joel Pereira, Manchester United’s agile goalkeeper. At the end of the last season, José Mourinho boldly stated: “We [Man United] have two great goalkeepers [De Gea and Sergio Romero] and a third one who will be the best Portuguese goalkeeper of his generation.” Such a compliment from one of the most recognized coaches of all time did not go unnoticed and is a sign of the promising future that lies ahead of Joel Pereira, one of the most exciting goalkeepers in the making. Born in the Swiss city of Le Locle on the 28th of June 1996, son of Portuguese parents that, like many other fellow nationals, emigrated to Switzerland searching for better life conditions, Joel Pereira started to play football at his hometown club as a 5-year old. He began to play as a defender, then a midfielder and then a forward. Only after experimenting every position in the pitch, Joel discovered his true vocation and settled as a goalkeeper, a position he did not trade for any other ever since. After a few years at Le Locle, Joel Pereira moved to a bigger Swiss club, Neuchâtel Xamax, at the age of 15. His consistently reliable and mature exhibitions led him to become one the most stellar prospects of Neuchâtel’s academy. And his evolution enabled him not only to play frequently in sides ahead of his age, but also to get calls from both the Swiss and Portuguese youth national teams. He started to play for Switzerland at the u-16 side but when the call from Portugal arrived, Joel did not think twice and started to be a regular presence at all Portuguese youth teams from the u-17 to the u-21 sides, even being capped at the Olympics. It was, however, defending Switzerland’s goal that Joel Pereira caught the attention of his current club. In a friendly against Italy, a Manchester United scout approached and congratulated him on his performance. The next year, Joel was offered a one-week experience period at the English giants’ training centre, impressing everyone and quickly securing a contract with the Reds. The following years were spent completing his upbringing as a professional footballer, playing for the United youth sides and sporadically training with the senior team, a sign of the confidence Alex Ferguson had in him. The Portuguese starlet confessed that those opportunities to learn directly from the likes of David De Gea, Victor Valdés, and, naturally, Alex Ferguson greatly contributed to his evolution, both personally and professionally. In the 2015/2016, being 19 years old, came the next stage of Joel’s rise to Old Trafford-like demands. It was a logical step to loan him to more competitive professional sides and the opportunity to play for Rochdale quickly appeared. Joel stayed there for a few months, impressing everyone at Spotland Stadium and being called back to his club of origin. Keith Hill, Joel’s coach at Rochdale said “In his first match he stopped a penalty, but it was not due to that situation that he delighted us. Joel is a huge professional. He was still very young and showed an above-average commitment for his age. I said, at the time, that he would a world-class goalkeeper and I maintain that idea.” After returning to Old Trafford in the winter, Pereira helped the under-21s clinch the Premier League title and in the start of the 2016/2017 the pattern in the Portuguese starlet’s career repeated itself, but with a competitive upgrade. He started the season with a loan to Belenenses, a top-tier Portuguese side where he performed outstandingly, causing The Special One to specifically ask his return to Old Trafford to be the third goalkeeper of the senior side. He made his senior Manchester United debut against Wigan in the FA Cup (playing 10 minutes) but the highest moment of his season arrived with his Premier League graduation against Crystal Palace, playing the 90 minutes in great fashion. The hopes placed on Joel Pereira started to augment and his presence at the 2017/2018 senior side’s pre-season was already a given fact. The compliments of Mourinho, were topped by Warren Joyce, his goalkeeper’s youth coach at United who says that Joel has the potential to be one of the best goalkeepers in the whole world. In spite of his young age, Joel Pereira has already established himself as a tall, commanding presence in the area, transmitting security to his teammates and mainly to the ones more directly charged with protecting the goal. He asserts himself as the defence’s leader that a goalkeeper is asked to be. He was many times the team’s captain while playing for United’s youth sides, and even if he is not the captain he does not shy away from “bossing around” and giving instructions to the defenders, even if those defenders are much older and experienced than him (proof of that can be watched in his Premier League debut). The Portuguese goalkeeper has shown a great deal of maturity from a young age (for example as a 18-year old he played for the u-21 Man United team and as a 19-year old he reached the u-21 Portugal’s national team) and, taking all these factors into account we can explain his style that combines the vocal game required to organise the back line and the confidence and trustworthiness that the defenders expect to find in their goalkeeper. Joel Pereira is also tailored to be a dominating-side goalkeeper, whether in his concentration that enables him to always respond with efficiency to the few chances the opposite side creates, or in his ease of being a part of his team’s build-up phase. In this aspect, Joel’s ability goes beyond the technical qualities he certainly possesses, displaying also a swiftness in the decision-making process that allows him to almost every time make the right choices to begin his team’s pursuit of the opposing net, something that comes in handy mainly in counter-attacks. For starters, the Portuguese youngster is a very calm player between the posts, a fundamental strength that many of the people that worked with Joel point out when describing him. Moreover, he reveals a capability of predicting the outcome of most plays and is always prepared to act or react. His keenness in “reading” the opposing side turn him into a very efficient goalkeeper, one, as we stated above, that is tailor-made to star in big clubs. Joel also shows great discernment of when to leave the spot between the posts and intervene in the area in anticipation. For a goalkeeper, Joel Pereira has an above-average technical quality, mostly revealed in his passing skills, displaying strong and precise distribution when starting plays with goal kicks and a well-developed passing game when communicating with the defenders in the build-up phase. Furthermore, he is very agile (which granted him the nickname of “El Gato” – in English “The Cat”- while still at Neuchâtel Xamax) and shows an outstanding presence in 1×1 duels. His agility and defending skills are enhanced with his innate talent to stop penalties and with his surprising set of resources, frequently producing saves in non-orthodox ways (for example with his legs). Joel Pereira’s main weakness must be his frailty in the movement of leaving the posts in high balls. Although he knows when to leave the comfort of a more static positioning in front of the goal, he needs to improve his technique in this process. When Joel attempts to keep the ball in his control and not just punching it away (in order to avoid possible rebounds that further endanger the goal) he struggles and often creates panic between the defenders. His lack of technical stability in this particular moment of his game, stains his calm and dominating presence in the area. For example in a match against FC Porto, while playing for Belenenses, Joel, pressured due to a high ball in his area with just minutes to end the game, failed to grab the ball at the first attempt in the middle of two Porto’s strikers. The fact that the situation at hand was an easy cross with little direction or strength further highlights that such a weak struggling performance should not take place in Joel’s level. I do not believe, however, that this is a congenital weakness; it is just a matter of perfecting the regularity while executing the said movement. In spite of that, I do have to recognize that Joel Pereira does not reveal the traditional, inexperience-related difficulties of young goalkeepers. In fact his calm and confidence have already been underlined as one of his greatest strengths. His rise to stardom has not yet took place mainly to the competition of De Gea and Sergio Romero at Man United; and a regular spot at the line-up is not expected to come for Joel in the short term. However, José Mourinho seems to have a plan for the future of the Portuguese starlet and the confidence he puts in him (having played the same amount of minutes of the other goalkeepers so far in this pre-season) as well as the recent renewal of Joel’s contract with the substantial salary raise (he now makes five times more money that he used to) show just that. As for Joel Pereira, his objective is clear: become the number one at Old Trafford. Mateus is a Portuguese lifelong Sporting Clube de Portugal fan and an avid Liverpool supporter. He studies law at University, and also incredibly passionate about football. He loves following La Liga, Premier League, Bundesliga, Serie A and the Portuguese Liga NOS as much as he loves writing about it.